It’s the time of year again to embrace cooking with our favorite fall flavors—namely pumpkin. Everyone should have the experience of roasting hulled pumpkin seeds at least once in their life. As these are roasting, your kitchen transforms into a cozy realm of autumnal flavor. You can practically hear the crunch of dry leaves and feel the crisp chill of the season! And when you’re done, you have a dead-easy, highly addictive little bite, great for snacking or garnishing soups and salads. Preheat the oven to 350°F. Line a rimmed baking sheet with parchment paper or a silicone baking mat. In a medium bowl, toss together the pumpkin seeds, honey, sugar, cinnamon, nutmeg, ginger, cloves, and salt until everything is thoroughly combined. Spread the mixture onto the prepared baking sheet and bake for 15 minutes, rotating the pan front to back halfway through the cooking time, for even browning. Let the pumpkin seeds cool completely before breaking into clusters. Package in a sealed jar or bag for gifting. Can be kept for up to 1 week in a sealed container. Reprinted from Food with Friends: The Art of Simple Gatherings. Copyright © 2016 by Leela Cyd. 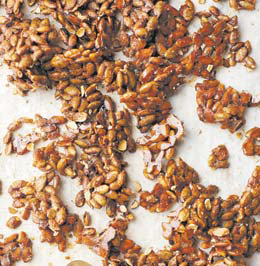 Be the first to comment on "Sweet and Salty Pumpkin Seed Clusters"